Snorkel at the famous Hanauma Bay! With three daily departures from Waikiki, this is the best way to visit Oahu’s #1 snorkeling destination with a duration of 5 hours (Round-trip with hotel pick up/drop off). Great for all ages and experience levels.The most convenient and reliable shuttle service from Waikiki to Hanauma Bay. 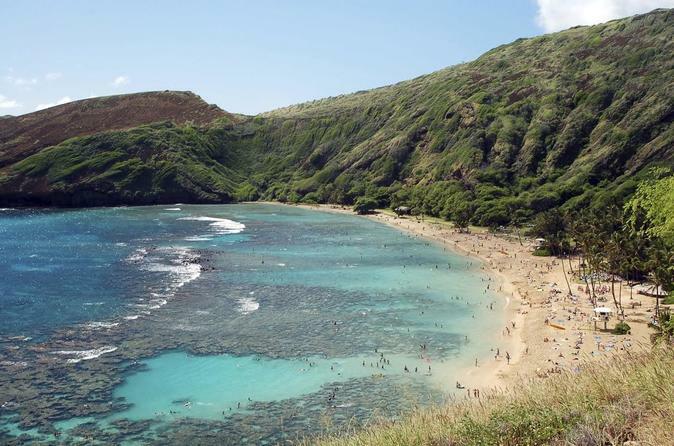 Hanauma Bay is a sunken volcanic crater and a protected marine life conservation area. The bay is one of the world's best places for beginner snorkelers! Swim among sea turtles and more than 450 species of vibrant tropical fish! You will be picked up from your Waikiki hotel at 7 AM, 9 AM, or 11AM and will be taken to Hanauma Bay. At the bay the driver will give you your snorkel gears. You will also need to pay a $7.50 state admission fee that is not included, the entrance fee is waived for children under 13, members of the active duty military (ID required), and for residents of Hawaii with proof of residency.